The text editor is used in both wikis and online documents. A pared down version of the text editor is used in discussions. Wiki pages and online documents will appear with the name listed at the top of the page in a text field when in edit mode. They can be renamed at any time by users with edit permissions. FrontPage cannot be renamed as it is a system generated name. Users with experience using word processors, such as Microsoft Word, will recognize most of the formatting options in the toolbar. Some iMeet® Central-specific and other options are explained below. The New Page button allows you to link to an internal wiki page which has not yet been created. When you save the page, the link will appear red, underlined, and with a question mark. Click the red link to create the wiki page and begin editing it. Once the new page is saved the link will turn from red to the normal blue color. Insert Link: To add a link, click on the Insert Link button in the editor toolbar. Add a direct or relative URL and a title for the link - this is the text that will be "clickable" in the document - and click Insert. You can also highlight text in a document and click the link icon to link it to another page. Attach File or Image: Attach files to the online document by clicking the Attach File or Image button. Select from files that already exist in the workspace or upload a new file. Insert More (Application Blocks): Application blocks are pre-configured elements that can be added to an online doc or a wiki page. There are many application blocks available. Click on the "Insert More" Button to get started. Plain Text Paste Tool/Paste from Word ( , ): It is recommended to use either of these options when pasting in content from external sources because background formatting used in the source applications can affect the text editor's behavior. HTML Mode ( ): Use this mode to edit the online document's HTML. You can use the code highlighting and formatting option to neatly display programming code. You can begin creating this by starting a new or editing an existing wiki or online document and then clicking on the button for code highlighting/formatting (see icon below). 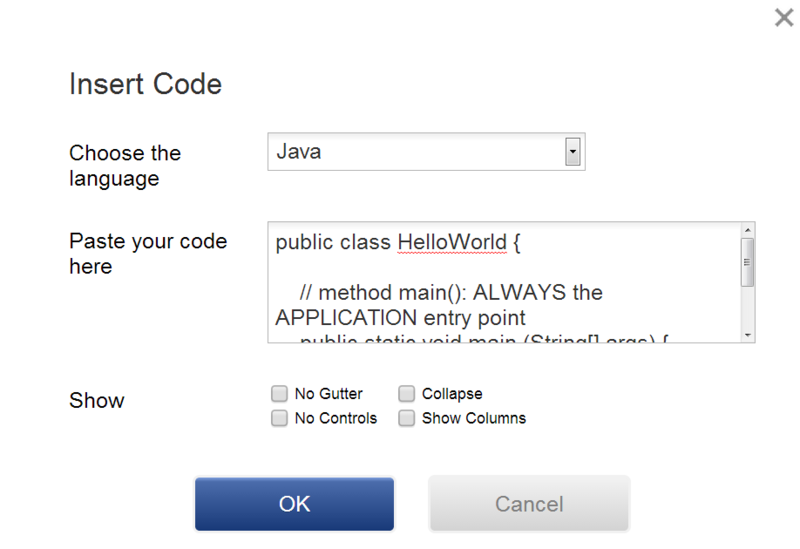 Next choose a programming language, paste your code, then click Ok.
Save your online document to display your code. It will look similar to the following screenshot. Tables are a great way to organize your wiki page or online documents. The below is an example of what can be achieved by using tables (along with application blocks) in the text editor. To insert an application block into a cell, simply put your cursor into a table cell, click the Insert More button, and select an application block. Right-clicking in a table will bring up the table menu. This menu is where table properties, along with the properties for the cell, row, and column you clicked can be edited. In the Table Properties menu, general table attributes can be modified. 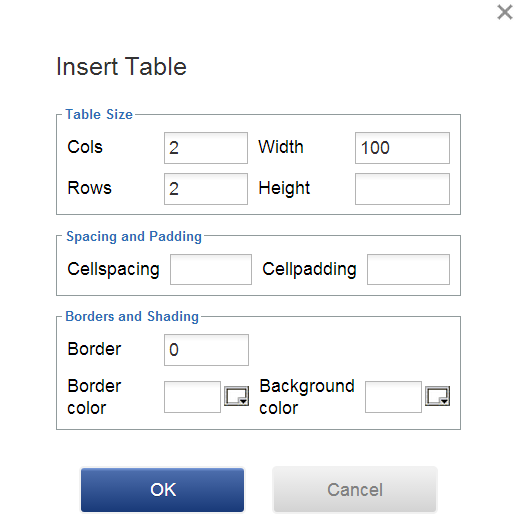 To modify the width of a column, right-click in the column, locate the Cell option, and select Table Cell Properties. Here, you can add a pixel width (indicated below). 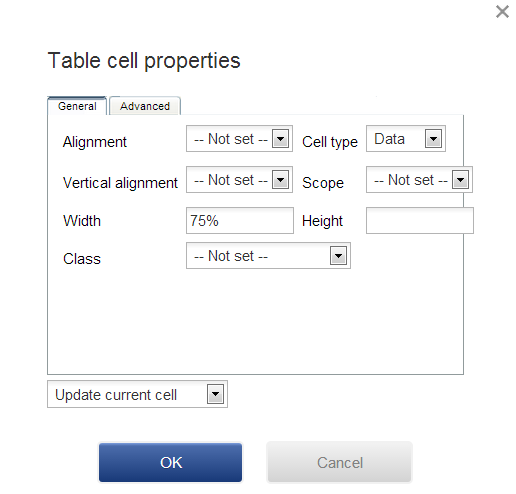 In the Cell Properties menu, other attributes of the cell like horizontal and vertical alignment can be modified as well. To make changes to multiple cells in a row or column, highlight the cells you want to change, right-click in the highlighted area, locate the Cell option, and select Table Cell Properties.